If you’re reading this, you already know how important energy is to us. It powers our transportation, logistics, industry, agriculture, homes, and the very digital device you’re using now. What’s the Collaborative Economy? An economic model where technologies enable people to get what they need from each other –rather than from centralized institutions. This has impacted cars, hotels, banks, retailers, manufactures, and more. How is the Energy Sector being impacted by the Collaborative Economy? You might be amazed to learn that P2P lending, Makers, and sharing are causing some changes. This week, I keynoted the North West Energy Conference, Efficiency Exchange, present were 500 energy professionals from utility companies, manufactures, and consultants were in attendance. I shared with them a few examples of how we’re seeing bottom-up, democratized startups enabling people to collaborate among themselves for energy creation, storage, and sharing. What’s a maker in the energy sector? Anyone who’s creating their own energy, and, perhaps, sharing it with others. Solar Mosaicenables thousands of people to have access to affordable solar loans, gives investors opportunities to fund renewable power, and allows clean energy supporters the power to spread the wealth of energy from the sun throughout their communities. Respected industry leader, Lisa Gansky​,​ is on the board. Yeloha is a new company that launched last week. They’re a network that allows for the sharing of solar energy between “sun hosts” and “sun partners.” For the 80% of Americans who would like to install solar panels on their roofs can’t afford to, Yeloha provides them with access to purchase solar energy generated by their neighbors. Tesla is now offering a home battery storage system for residences. The target market for these batteries are homeowners interested in backup storage from their solar panels in case of an outage, or for those living off the grid. This makes local neighborhoods more resilient and, combined with solar, potentially more independent. Vandebron arranges for consumers to buy electricity from independent producers. Based in the Netherlands, Vandebron, currently has 12 producers providing enough energy for 20,000 households. Customers receive their sustainable energy through the national grid, but from sources (typically farmers) and methodologies (wind, solar) selected by each individual customer. The company’s revenue stream is from subscriptions, which keeps them at arm’s length from promoting consumption. MuniRent enables public agencies to easily share heavy duty equipment internally and with other agencies. Yard Club benefits both contractors who own equipment and those looking to rent. The owners get to make some money on their equipment, while the renters save money compared to what they would pay traditional equipment rental companies. This, of course, begs the question: How else might cities and the companies who work with them become more energy and resource efficient? Ride sharing apps like Sidecar, Lyft Line, Europe’s BlaBlaCar and Uber Pool aim to maximize the number of passengers in a car, increasing efficiency of time, energy used, and traffic. Auto and Boat sharing apps like Getaround, RelayRides, Zipcar, BMW DriveNow, and Boatbound increase utilization of vehicles by allowing them to be shared. It goes without mention that Yerdle, Craigslist, Tool Sharing spots enable local communities to increase utilization of un-used goods, reducing global shipping and manufacturing. We’re in the Early Days of the Collaborative Economy, As it Begins to Permeate Society. These examples are on the horizon. There are just a few. Some of them have just birthed or have not yet been widely available, but there’s enough evidence to see how sharing and crowdfunding people are enabling to “make” and share energy independently, which could literally create shifts in the balance of economic power. 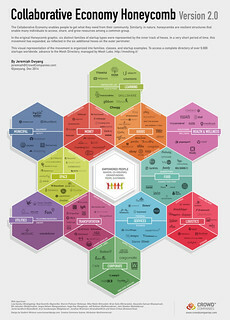 In December 2014, we launched the Collaborative Economy Honeycomb 2.0, featuring a Utilities hexagon which is broken down by Telecom and Energy. Some of the previously mentioned startups were not yet operating. We’ll include them in the next iteration of the graphic. This market is changing rapidly. In my presentation, I provided the business leaders of the Energy Sectors examples of how other large companies in other industries are adapting (see timeline, or detailed database), by creating and enabling P2P marketplaces around their companies or by providing a platform for others to co-create with them. In the case of the energy sector, large utilities could first enable solar on homes, take a revenue cut of the excess energy created, and provide marketplaces that enable the distribution of that excess energy within in a region. The role could shift to facilitator or enabler as the crowd continues to buy in. To learn more about my vision about how large companies can participate, here’s my full body of work. Update: Here’s a video interview of me, at the conference, discussing the energy opportunities in the Collaborative Economy.